Republican presidential candidate Donald Trump speaks during a campaign stop on the campus of the University of Central Florida in Orlando on March 5, 2016. “He” is Donald Trump, candidate for the Republican presidential nomination. He appeals to the hatred in America, uses “fear of other” to persuade his supporters, yet wants to “Make America great again.” He is the voice for xenophobia, for those who are afraid to say what they are thinking, and gives them permission to do the things they’ve always wished they could do. Although Trump claims that he does not incite violence, no one has been hurt and he does not want to see anyone get hurt, he has a history of encouraging violence and retaliating against those who confront or challenge him. Here is a timeline of the occasions when he’s had demonstrators or reporters removed from his events, summoned violence and/or supported it. 1. Aug. 25, 2015: Jorge Ramos vs. Donald Trump. At a press conference in Dubuque, Iowa, Ramos, a well-known Univision journalist (The Root is owned by Univision), stood up to ask Trump about his immigration plan. Trump told Ramos to sit down because he had not been called on and he refused. “As a U.S. citizen, I have the right to ask the question,” he said. “Go back to Univision,” Trump uttered. He then had security personnel remove Ramos from the room. Later on, Ramos was invited back into the room and allowed to ask his question. 2. Oct. 23, 2015: Trump says he’ll be “more violent” during campaign rally. 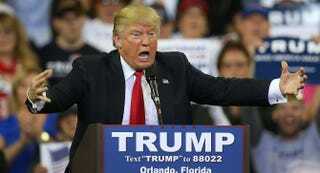 Trump was interrupted several times during a rally with hundreds of attendees in a ballroom at the Trump National Doral resort near Miami. As the disruptions continued, he became more aggravated. 3. Nov. 21, 2015: Activist is beaten and removed from premises—and Trump approves. At a Trump rally in Birmingham, Ala., 31-year-old Black Lives Matter activist Mercutio Southall Jr. was assaulted while on the ground—kicked, punched, choked, and called “n—ger” and “monkey”—by a group of white men and women. After he shouted, “Black lives matter!” Trump called for him to be ejected from the event. Southall refused to leave the building and was subsequently attacked by at least six people. Police eventually escorted him out. On the Fox News Channel, Trump said that Southall deserved it. “Maybe he should have been roughed up because it was absolutely disgusting what he was doing,” he said. 4. Jan. 8: Muslim woman wearing hijab and “I Come in Peace” T-shirt is expelled from rally. Rose Hamid, a 56-year-old Muslim woman, was escorted from a Trump rally in Rock Hill, S.C., after standing in silent protest during his speech. Her act was a response to Trump’s comments asserting that Syrian refugees were connected to the Islamic State group. 5. Feb. 22: Trump says he wants to punch a protester. A rally in Las Vegas was disrupted by a protester during Trump’s speech, and as the man was escorted from the premises, Trump told the crowd about “the old days” and how he wanted to handle him. “I love the old days. You know what they used to do to guys like that when they were in a place like this? They’d be carried out on a stretcher, folks,” he said. 6. Feb. 29: Black college students are ejected from event on campus. At Valdosta State University in Georgia, approximately 30 black students—wearing all black—were removed from a Trump rally before he started speaking—and, according to Valdosta Police Chief Brian Childress, at the request of the Trump campaign. However, Trump staff have denied that he or the campaign initiated the request. The students said that they were standing silently on the gym bleachers and all they planned to do was sit in silent protest. 7. March 1: Young black is woman attacked by Trump supporters during rally. During Trump’s Super Tuesday rally in Louisville, Ky., University of Louisville student Shiya Nwanguma was attacked by Trump supporters. As Nwanguma was escorted out of the rally, she was pushed and shoved by supporters—mostly men. She was also called “n—ger” and other racial slurs. 8. March 4: Trump says he’ll provide legal counsel for supporters who hurt protesters. A group of attendees was removed from the rally at Macomb Community College in Warren, Mich., because of their objection—either by speaking their minds or wearing Trump-bashing gear. When a protester interrupted, Trump declared that he would legally support his fans if they injured a protester. 9. March 8: Journalist Michelle Fields is grabbed by Trump campaign manager. Breitbart journalist Michelle Fields filed a report with the Jupiter, Fla., Police Department March 11, alleging that she was injured during a Trump press conference. Fields said that Trump’s campaign manager, Corey Lewandowski, forcibly grabbed her arm as she tried to interview Trump, causing bruises. Washington Post reporter Ben Terris said he witnessed the incident and agreed with her claim. As does C-SPAN video. 10. March 9: Black protester is punched in the face by 78-year-old white man during rally. At a rally in Fayetteville, N.C., several black protesters were being escorted out, accompanied by supporters booing and shouting racial slurs. Video footage of the event shows that as 26-year-old Rakeem Jones walked up the stairs to exit, 78-year-old John McGraw, a white man, punched him in the face. McGraw was arrested and charged with assault and battery and disorderly conduct, and Trump said that he is looking into paying McGraw’s legal fees. 11. March 11: Protesters are arrested and a man is bloodied during rally. Protesters in St. Louis were escorted out of the Trump rally at the Peabody Opera House. Trump was swift to respond, calling them “troublemakers” and urging the police to move quicker to eject them. Outside the event, tension between supporters and protesters led to confrontation, and a bloodied protester who had been punched in the face was given medical treatment. Over 30 people were arrested. 12. March 11: Trump cancels event because of attendance of thousands of protesters. Without consulting with the Chicago Police Department, Trump canceled the rally at the University of Illinois at Chicago. He said that he was concerned about security and didn’t want to see anyone get hurt. However, after his announcement was made, angry supporters and ecstatic protesters got into fistfights. Trump blamed the confrontations on activists, as he regularly does, and in an interview that night with CNN’s Don Lemon, he said, “I certainly don't incite violence.” According to a Chicago police spokesman, there were five arrests and the Chicago Fire Department said that three people, including a police officer, were injured. 13. March 15: Politico reporter is granted, then denied, access to Trump event. On the morning of Super Tuesday 3, Politico reporter Ben Schreckinger received an email granting a press pass to Trump’s press conference, then received another email several minutes later denying access. For over six months, Schreckinger has regularly covered the campaign, and his most recent story on the Trump campaign is focused on concerns about campaign manager Corey Lewandowski's quick temper and leadership style.